Olli Rehn, the Commission Vice President for Economic and Monetary Affairs, will take up his MEP seat and is likely to be replaced by Finnish Prime Minister Jyrki Katainen from 1 July. 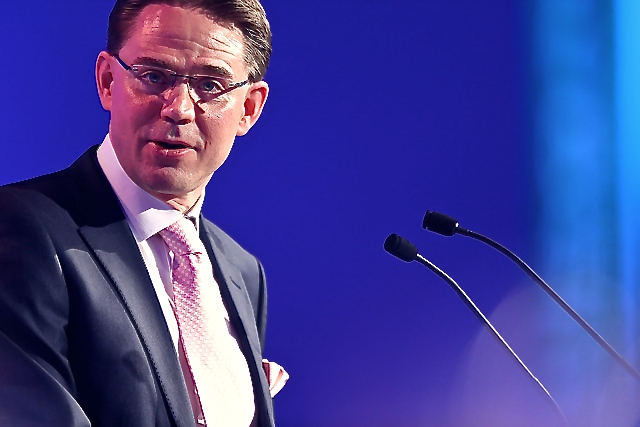 Katainen, whose party NCP is EPP-affiliated, makes no secret that he wants to be the next Commission President. According to information obtained by EURACTIV, Olli Rehn, who was elected as MEP by his liberal-affiliated Centre party, has decided to take his seat as MEP. This means that Commission President José Manuel Barroso will have to invite the Finnish government to send another Finn as member of the College of Commissioners, in which all 28 EU member countries are represented. At the 27 May summit, Finnish Prime Minister Jyrki Katainen, from the centre-right National Coalition Party, said that he was prepared to re-locate to Brussels in early July, if he is appointed to succeed Rehn as Commissioner. “I’m ready to start on 1 July, if possible,” Katainen told Finnish reporters in Brussels on Tuesday. Karainen makes no secret he is interested in a top EU job, ideally that of Commission President. Last April, he said he would resign this summer after three years in office, and was available for EU or international roles [read more]. In view of the opposition building among EU heads of state and government against Jean-Claude Juncker, the EPP Spitzenkandidat at the European elections [read more], it should not be excluded that another EPP-affiliated politician will get the job. However, Katainen is far from being the only possible compromise candidate. In EP circles, the name of former Latvian Prime Minister Valdis Dombrovskis is also frequently mentioned, EURACTIV was told. “It is time for new faces,” an EPP source told EURACTIV, signalling that Juncker was no longer a viable option. he European elections were held in all EU countries in May 2014. The Lisbon Treaty states that the European Parliament shall elect the commission president on the basis of a proposal made by the European Council, taking into account the European elections (Article 17, Paragraph 7 of the TEU). This will apply for the first time in the 2014 elections. The EU summit held on 27 May, two days after the European elections, gave a mandate to Van Rompuy to start consultations in view of electing a new Commission President, leaving the door open to other options, rather than nominating the winning centre-right candidate in the EU elections, Jean-Claude Juncker [read more]. This guy would be a million times better than Juncker and has a much more suitable profile for what Europe needs right now. Although, I’m not so sure that the article actually shows any evidence that he’s eyeing Barroso’s job. I hope so that and am heartened that an EPP source has stated that “It is time for new faces” and that it’s acknowledged that Juncker is no longer a viable option. The EPP has an important role to play here, since they are mainly the ones trying to foist Juncker on us. No , this Guy called Katainen NOT not but instead Alexander Stubb would be at least as good as Juncker is ! Katainen is ONLY a non elected UNCANDIDATED!!!! But J.C. Juncker IS an officially elected candidate from the parliament ! AT least democracy has to be respected! Is that the way European democracy goes forward bypassing the people ? Jean-Claude Juncker is elected and will be the President of the commission! Some State Leader are acting very irresponsible ! JC Juncker as Commission President ! Alexander Stubb or Tony Blair as Vice President !